Cancer immunotherapy technologies frequently star in biotech news headlines. Scientists have pursued many approaches intended to enlist the immune system to fight tumors, including CAR-T therapies and checkpoint inhibitors. Cancer vaccine technology is one of the technologies under this broader immuno-oncologic umbrella. This approach entails using one or more immunogenic antigens to teach the immune system to attack tumors. As a recent article in Xconomy highlighted, there are no approved products that use this approach to fighting cancer. However, using the LSN Company Platform we can identify many companies worldwide that are developing the cancer vaccines that could come into clinical use in the future. 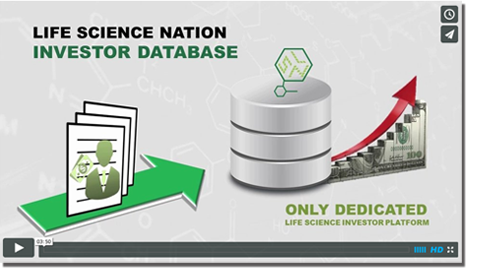 The LSN Company Platform provides detailed profiles on early-stage life science companies and products under development worldwide. From this data, we took a sample of vaccine companies developing therapeutics for the oncology sector. This sample consisted of 69 companies. 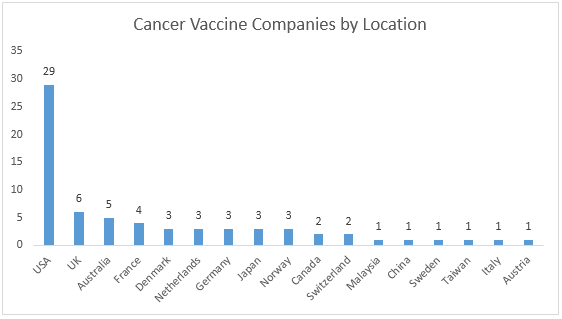 While a significant number of these companies are based in the USA, we also found information on companies developing cancer vaccines throughout Europe and the Asia-Pacific region. 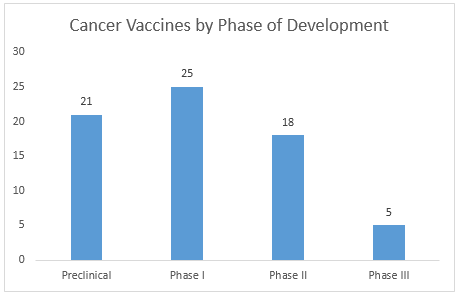 Only 5 cancer vaccine assets in this sample are currently undergoing Phase III trials. This affirms the perception that cancer vaccine technology is a field that is approaching maturity; the many early-stage assets identified by the LSN Company Platform show the field’s potential, but few cancer vaccine assets are likely to reach market in the near term. However, investors interested in early stage immuno-oncology assets will be closely watching the field’s progress. 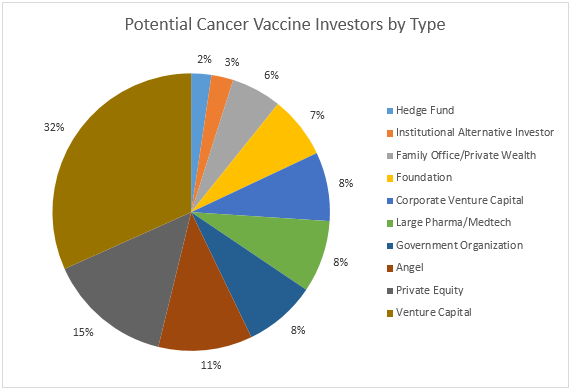 Multiple investor types are open to investing in cancer vaccines. Venture capital and private equity firms predominate, but we see significant potential interest from other types of investor, including large healthcare corporations and their venture arms. 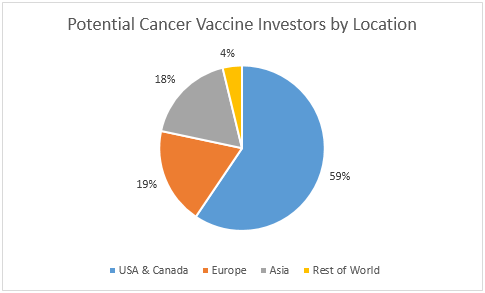 With this level of global investor opportunity, cancer vaccine companies have many potential sources of capital to move their assets forward. LSN will look forward to seeing cancer vaccine technology mature and reach the marketplace in the years ahead.